Featuring Laura Stack, Dr. Tony Alessandra, Dr. Larry Iverson, Dr. Mike Siegel and more. 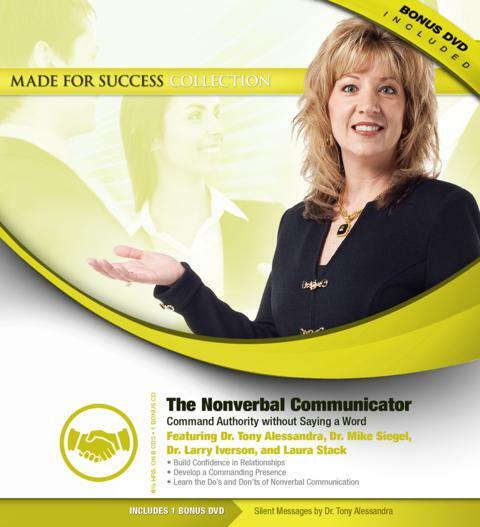 According to recent studies, your nonverbal signals communicate more powerfully than your words. What do your body language, clothing choice, and vocal intonation say about you? Knowing exactly what you want to communicate by your body language can be the difference between winning the sale, getting the job, or influencing groups of people to your point of view and not. Learn from experts in communication and psychology how you can structure your communications more effectively by understanding the laws of approachability and the psychology of great communications. Armed with this information, you will quickly be able to assess where others are coming from to build instant rapport. With the knowledge from this series of recordings you will increase your charisma, credibility, and clout. Your actions will determine how you are perceived: weak or powerful, unsure or confident, insecure or ready to take on the world. Don’t leave your communications to chance; take control of how others perceive you both in and out of the workplace. DR. TONY ALESSANDRA, a former graduate professor of marketing, earned his PhD in marketing in 1976 and has published fourteen books in seventeen foreign languages. As an entrepreneur, he is president of AssessmentBusinessCenter.com, cofounder of MentorU.com, and Chairman of BrainX.com. Recognized by Meetings & Conventions Magazine as “one of America’s most electrifying speakers,” he was inducted into the Speakers Hall of Fame in 1985.